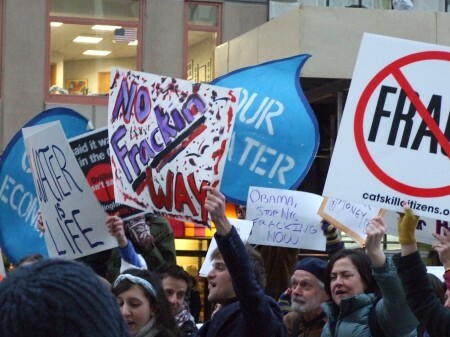 Ossining, NY – March 7, 2013 – Yesterday afternoon, the New York State Assembly passed a moratorium on issuing fracking permits until May 15, 2012 in legislation that also requires the state to undertake a comprehensive health impact assessment to be completed no later than April 15, 2015. This past Tuesday, March 5, 2013, the five members of the Independent Democratic Conference also introduced a moratorium bill in the Senate, which would prohibit the state from finalizing its environmental review process until two comprehensive studies that are currently being conducted on the health impacts of fracking are completed. The Senate legislation also prohibits finalizing of the fracking SGEIS either until the expiration of 24 months from the effective date of the act or until the studies deemed relevant by the State Health Commissioner have been completed and produced sufficient data to make a recommendation to DEC regarding permitting fracking in New York. Riverkeeper urges the Senate to pass this legislation and conference with the Assembly to put a bill on the Governor’s desk during this administrative session. My name is Kate Hudson. I am here representing Riverkeeper, as its Watershed Program Director. Senate Independent Democrats have today taken an extremely important first step to protect one of New York’s most precious resources, the health of its citizens, its communities, its children. Riverkeeper commends Senators Klein, Savino, Valesky, Carlucci, and Smith for introducing a bill that will direct the State to review the science on fracking’s human health impacts. Passage of this moratorium legislation will go a long way to ensuring that New York does NOT follow in the unwise footsteps of its neighbors and states across the country in opening the door to the Trojan horse of fracking before understanding the consequences it will have for public health. New York has a unique opportunity, which Senate and Assembly leadership have wisely decided to take advantage of, to learn from the unfortunate experiences of others in states that have moved forward with allowing fracking before understanding what the health and human costs will be. We look forward to working with the leadership of both houses to support the passage of a bill, this session, which will take full advantage of that opportunity. Legislation that guarantees that the state will undertake a comprehensive assessment of fracking’s health impacts, an analysis that is able to benefit from the science and the first in the nation systematic studies that are just now being initiated. The twenty-four month moratorium called for by the Senate bill, and the similar period provided for in the Assembly legislation, and the requirement that the public health impacts of allowing high-volume hydraulic fracturing in New York be comprehensively assessed using all of the scientific information that becomes available during this period before making any determinations about fracking in New York that both bills propose, will go a long way to assuring that the health of New Yorkers is protected. We also fully endorse the direction in the Senate’s legislation to put the finalizing of the environmental review and SGEIS on hold until a comprehensive analysis of fracking’s health impacts has been completed. Finally, we urge the Senate to support public participation in this health impact review process so that its outcome will be something that New Yorkers can trust. We are grateful for the strong leadership shown by the Senators here today, as well as that of the Assembly members who co-sponsored the legislation they introduced on Friday. Thank you for your leadership on this issue, which could not come at a more critical time, and for putting the health of New Yorkers first.